This is a brief description in "Laymans Terms" of how to feed and keep large polyp non-photosynthetic corals (NPS coral). I see countless threads and questions regarding "how to feed my new sun coral", or "how do I get the polyps on my new sun coral to open?" 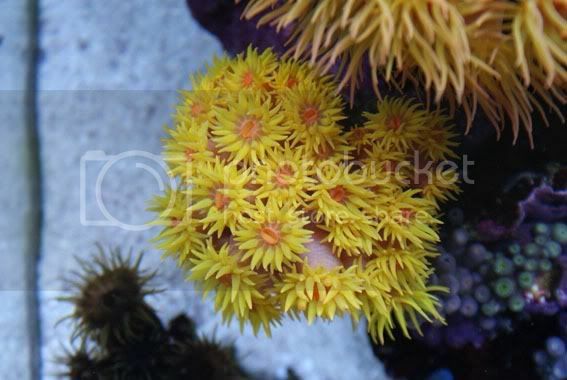 They're honestly a relatively easy coral to keep, some just require a little TLC. 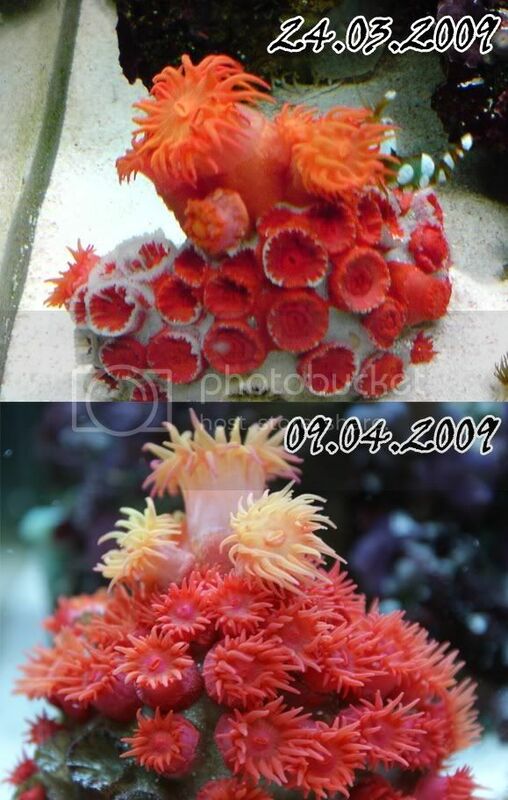 The following process can be followed for any large polyp non-photosynthetic coral Genus, such as Tubastrea ("Sun Coral"), Dendrophyllia ("Dendros"), Balanophyllia ("Balanos"), etc. 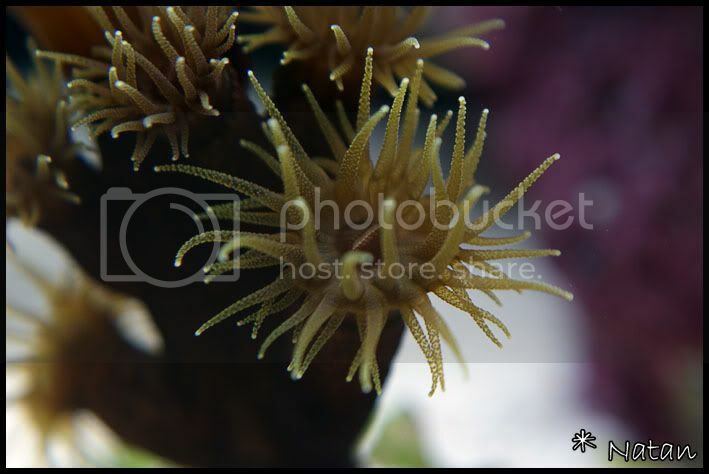 First acclimate your new NPS coral as you would any coral, inspect for pests, and dip accordingly. 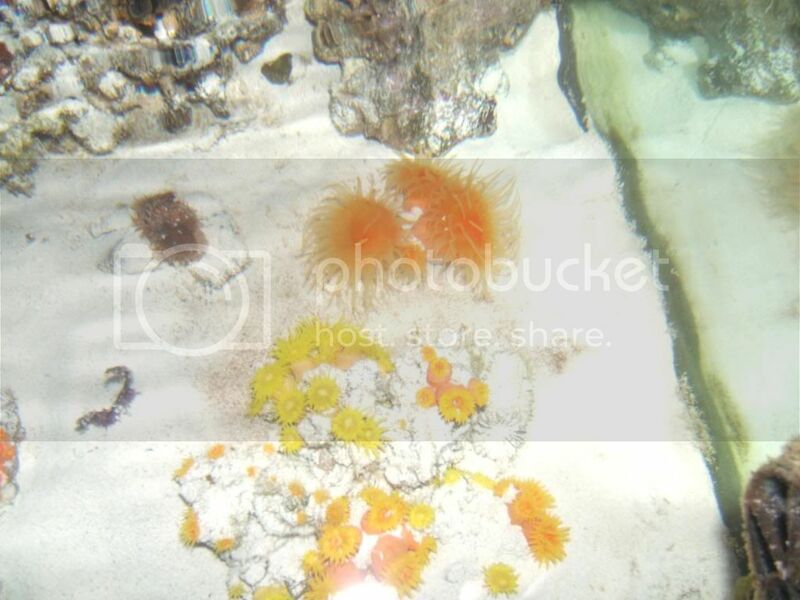 There are several predators that feed exclusivlely on a certain NPS coral such as nudibranchs and snails, and the predator will generally retain the color of the Species they eat. I recommend quarantining (QT) all new incoming corals or fish, so that should be your next step if you QT new acquisitions. Once in the QT (or display if you skip QT) feed the tank as you would any day and watch for the polyp(s) on the NPS coral to open. If they open, feed 'em! 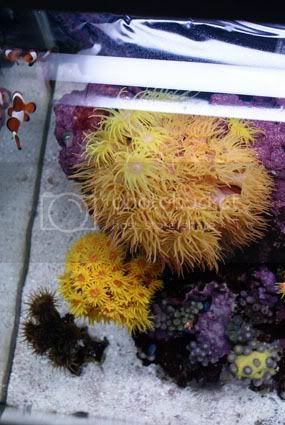 Keep in mind that the polyps do not need to be fully extended! If you see even one lilttle tentacle peeking out of the coralite feed it, and then the polyp will begin to fully open in due time. In my opinion spot-feeding is the best means to feed these guys as it's easy to control how much food is going into the tank and ensure that no food goes to waste by having all the food go into a polyp, rather than scatter throughout the tank and create excess nutrients. Personally I use a "KENT SeaSquirt" to feed; Pull the little tiny end off of it, sometimes you have to cut it off as some of them are glued, then you can feed meaty foods with them rather than just liquids. I have several of them, two with different bends to feed in hard to reach places, and one straight one (to bend them, heat over the small extension over the stove for a minute and gently bend it). Turkey Basters work great too, along with eye droppers from the drug store for very small foods. It is important to attempt to feed every polyp! It's thought that the colony only shares "stored" energy; Large polyp NPS coral stores Nitrogen and Phosphorous within the skeletal body, which is one way they survive long transit times. It can be tedious, but you will develop a routine that should only take a few minutes. I have over two hundred individual mouths to feed, some very small, some larger (depending on species) and I can feed every single one of them in under fifteen minutes. One thing to watch for while keeping large polyp NPS coral, especially keeping many of them, is high (detrimental) nutrient levels. As with any aquarium you have to make sure that your nutrient import (feeding, source water, etc.) equals your nutrient export (water changes, skimmers, denitrators, probiotic systems, etc.). Many people who keep NPS only tanks utilize probiotic systems (me included) in order to keep nutrients at bay, although this is by far a necessity, as any means will work as long as you keep parameters in check. This is however one reason I highly recommend spot-feeding rather than broadcast feeding as you can control the food rather than letting it loose in the water column. Large polyp NPS coral are not as finicky when it comes to Phosphate and Nitrate levels as say, Acropora Species are, although if Phosphate levels are allowed to climb too high it will inhibit calcification as with any true (calcifying) coral. If Nitrate levels are allowed to climb too high it will start to cause tissue recession and eventual death. I’ve let a colony sit for over an hour “soaking” in the tupperware with no ill effects… generally they will open after fifteen minutes or so though. 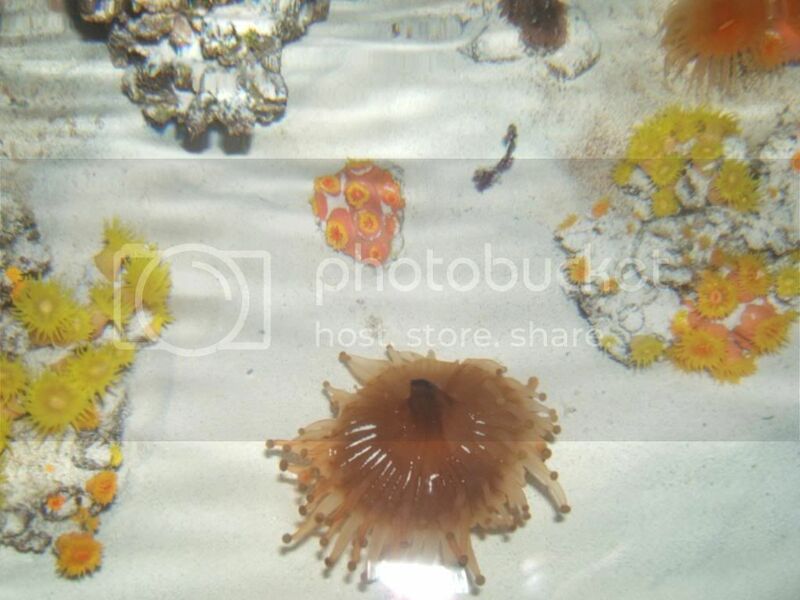 If for some reason the coral doesn’t extend it’s polyps at all, gently shake any food off the coral, remove from the tupperware and place back into the aquarium. Try again in a day or so and eventually it will open for you, unless it’s beyond recovery, in which case it will die – I’ve never had or seen this happen though, even with the roughest looking specimens. Generally the tupperware method only needs to be done with corals of the Genus Tubastrea as in my experience they come in looking mighty rough sometimes compared to their other NPS counterparts… why you might ask? Most other large polyp NPS corals cost a pretty penny compared to Tubastrea Species (which really are a dime a dozen), therefore they come through the distribution line fairly quickly whereas Tubastrea will be collected by the diver, taken/shipped to the exporter, then shipped to the importer, then shipped to the wholesaler (sometimes is the importer), then shipped to the retailer where they often sit a considerable amount of time, then bagged up and taken home. Generally during that entire period they are never once fed, leading to them being starving by the time we get them and reluctant to open for feeding (takes energy to open and feed). 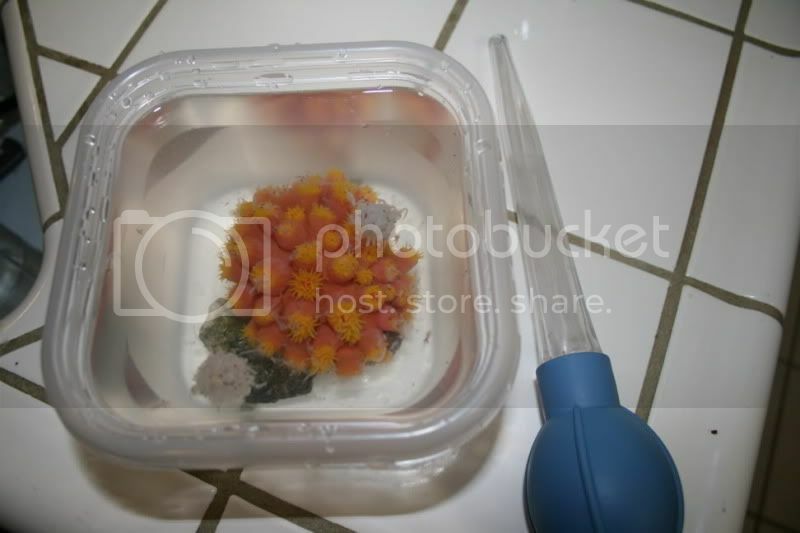 But follow the tupperware method and you'll have a happy, healthy coral in no time! Do I HAVE TO Spot Feed These Corals? The short, simple answer is yes. 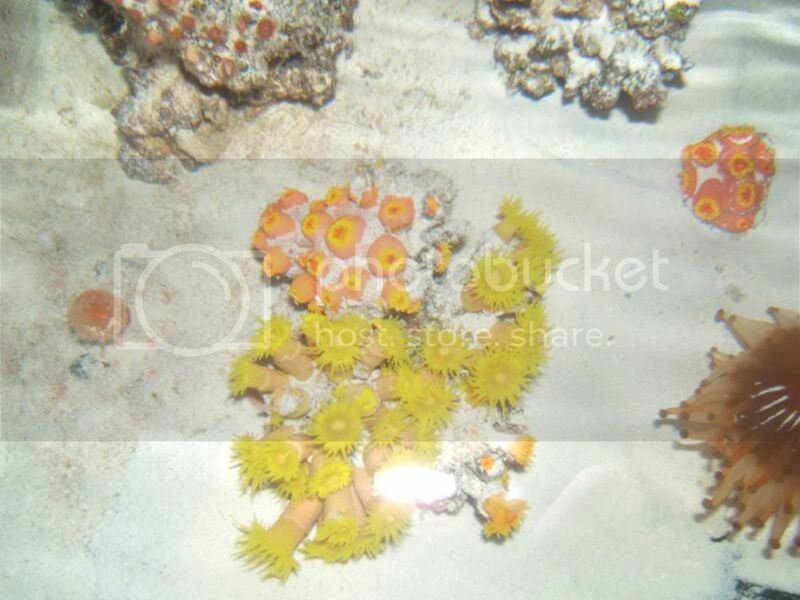 If you do not want to take the time/effort to spot feed these corals, please do not buy them, no matter "how pretty" the orange or yellow colors may be. Plus... it's FUN to feed them! I get the most enjoyment out of the hobby while feeding all of my large polyp NPS coral, which is the reason I only keep them now! You will occasionally see people who keep them that do not spot feed them. These hobbyists do a variety of things that allow them to be successful with these corals that most hobbysist do not, or cannot do (yet ). 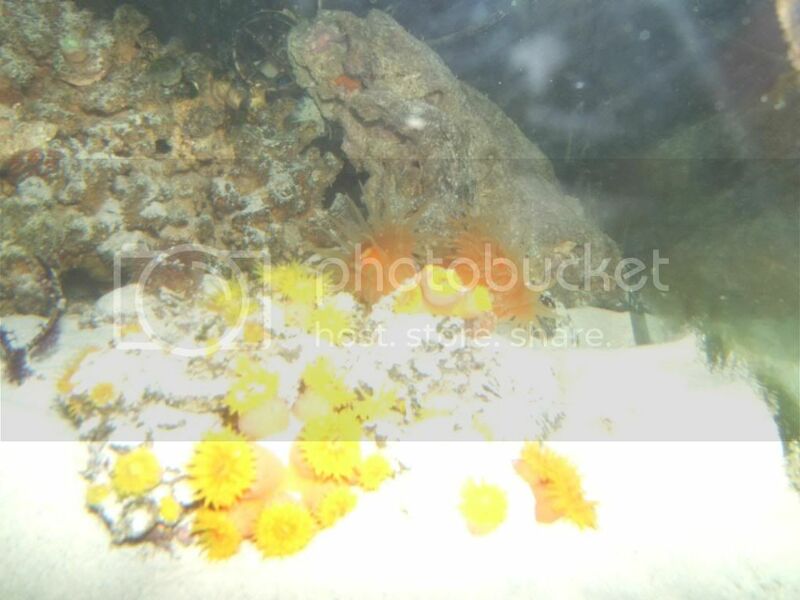 Some have copious amounts of live food available in the water column and rockwork such as copepods, mysid shrimp, etc. 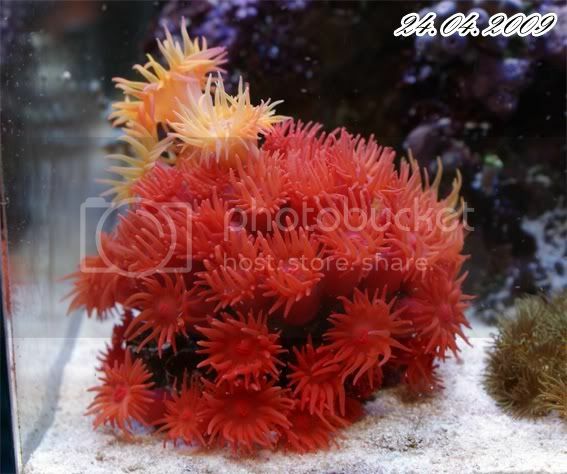 which actually provide excellent, constant food sources for the large polyp NPS corals. If you have a very mature, diversified tank, chances are you'll have to feed these corals very little unless you have fish that wipe out the population of live food sources. Other hobbysists feed their fish copious amounts of food, and between the particulate matter (excess foods) caught in the water column along with detrius and fish feces the NPS coral are able to thrive without direct feedings. Most of the above is to be mentioned strictly regarding Tubastrea and some Dendrophyllia Species... Balanophyllia and other NPS Genuses will be hard pressed to even live without direct feedings. Do They Have To Be Mounted/Kept in the Dark? This is a common misnomer regarding large polyp NPS coral, and the answer (with some restrictions) is no! Most of the large polyp NPS coral we see (Tubastrea and Dendrophyllia) are outcompeted by photosynthetic coral in that they grow sooo much slower than their photosynthetic counterparts and are overgrown by them, therefore they must reside in the depths. I have personally seen Tubastrea faulkneri while diving with polyps fully open in bright sunlight in only ten feet of water! Also, in nature these corals are obviously not spot fed by a turkey baster, they rely on Zooplankton and other small critters to feed on, which only come out of the rocks at night! This is why many newly imported large polyp NPS corals will only extend their polyps at night. On that note however, surprisingly some NPS are light sensitive, take Balanophyllia Sp. for example. Any of them that are light sensitive should be kept in a very low light tank, or under overhangs so you can still enjoy the beauty of them when they open. One well known hobbyist even stated that her Balanophyllia closes up (after open once the lights are off) if she turns the TV on in the same room! Hope that helps and enjoy your gorgeous large polyp NPS corals! 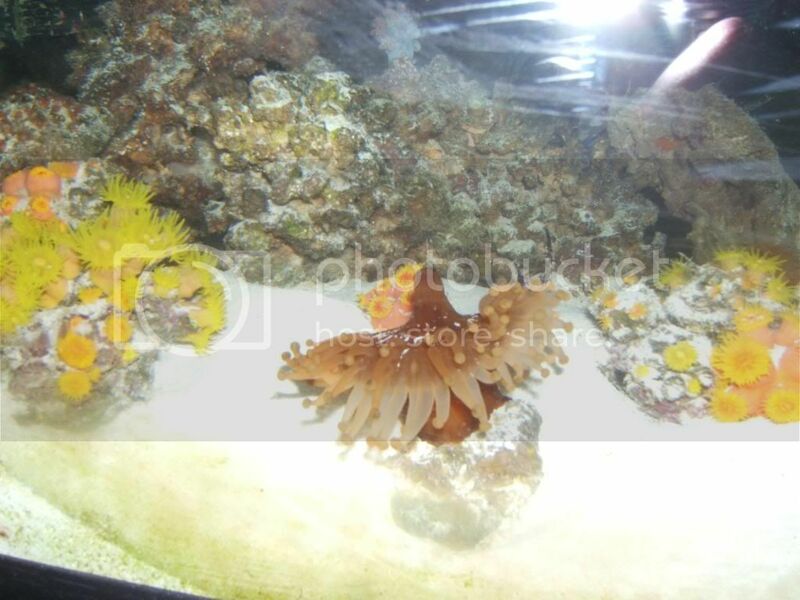 If you see a LFS that routinely brings in any large polyp NPS coral that watches them wither away please give them some insight (or this write-up), or urge them to stop bringing them in to end the madness! This is an excellent reference and should be stickied at the top of the forum! Good job. Very good! Though, I would like to add that over feeding is in fact possible. 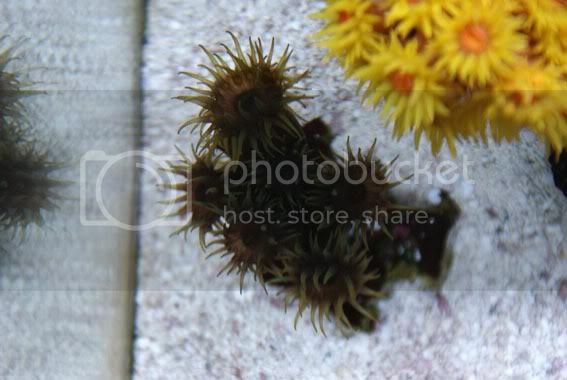 I managed to split my dendrophyllia by feeding it too much squid. It honestly ate until the tissue just popped... Recovering now. How about some advice on flow requirements? My sun corals have not been opening up as much lately. I am not sure whether its because I have significantly increased the flow for the Dendronephthya or because the fish are always stealing food from them. Oh yeah, that's another thing. It's best not to keep anything that will steal food from them, it becomes a PITA. Personally my tank is too crowded to use the bottle method so I have to stand there and chase everything away or put a bunch of food in the tank. Very good thread. One thing we could add to this is pics of the various species we have, along with some effort to identify them. One thing I've had a particularly difficult time with is figuring out how to identify the various Tubastrea species. Very interesting read, for sure. 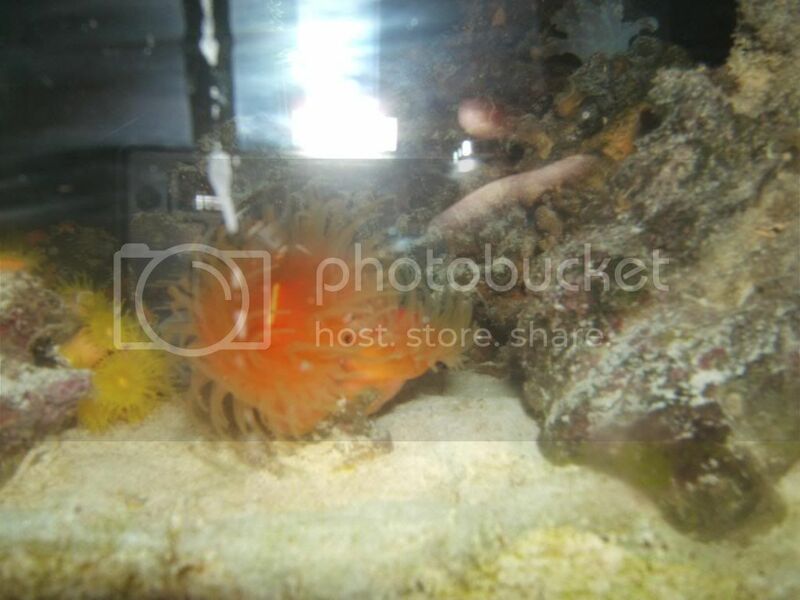 Here's my yellow and orange-polyp Tubastrea. I bought the Tubastrea colony in pretty bad shape and have been working on fattening them up with daily spot feedings of mysid, enriched brine shrimp, reef plankton, and marine flake food. In a few weeks, they've already started to show significant improvement. Also in the picture, to the left of the Tubastrea colony, is my Balanophyllia sp., at least that was what it was sold to me as. It has also gotten pretty fat since I've purchased it. It only opens at night. Here's another colony of Tubastrea that was purchased at the same time as the other colony, both in poor shape originally. This is my current prized piece: my five-headed Dendrophyllia colony. This thing eats like a total pig and is pretty much fully extended all day. This is not in the family dendrophyllidae, but it is a large-polyp NPS: my huge pseudocorynactis. I call it Audrey II, ala Little Shop of Horrors, because it has that funny puckered look to it and is practically a man eater in the way it eats. I've accidentally touched its tentacles a couple of times and it sticks to my hand pretty strongly - seems pretty intent on eating my finger. very nice! I've come to the conclusion that my sharknose gobies are irritating my sun corals and keeping them from opening. I now have the wonderful task of trying to catch the suckers and relocating them to another tank. Though, I would like to add that over feeding is in fact possible. Very true... all of the large polyp NPS coral can be overfed. 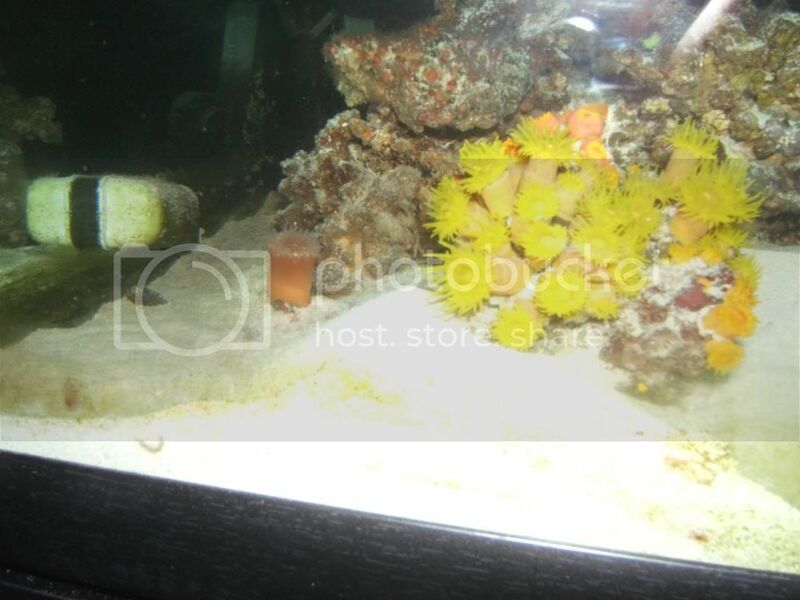 Not only can what you experienced happen but I've seen a coral accept so much food at one time it could not sufficiently digest all of the food it had, and the food actually rotted away in the gut causing issues. In my experience it's better to feed more frequent, smaller feedings, which in turn keeps their polyps open all the time For example, I'll feed a each polyp of one of my Dendrophyllia (Sp.) colonies a single P.E. Mysis shrimp (very large Mysis) every other day or so. It would surely accept more than that, but it grows rapidly and is "happy" all the time so there is no need for additional food. How about some advice on flow requirements? 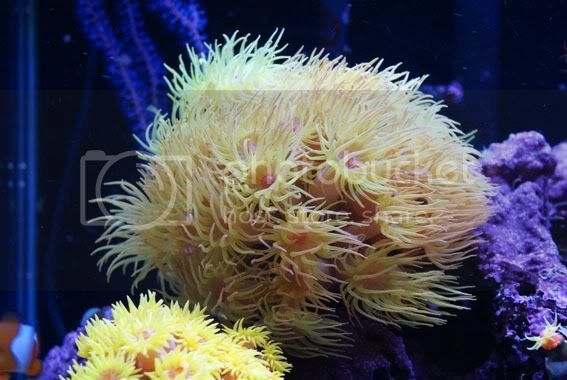 Generally speaking most large polyp NPS coral are very forgiving regarding the flow issue. In a "hobby term" I would say "low to medium" flow is required, but that means very different things to different people and systems. You want to make sure that detrius is not building up and sitting on the skeleton, but you also want to make sure that the polyps don't look like they're going through a hurricane. While feeding many times it's a good idea to turn all flow off to make feeding easier, however they can feed efficiently while flow is still on (assuming they're a healthy specimen). I spot feed directly to every polyp and rarely, if ever, do I turn any pumps off while feeding. Specific exceptions I can think of are Tubastrea micrantha, Dendrophyllia cribrosa and any other "true" branching large polyp NPS coral as they are found in higher flow areas than other Species and require higher currents to keep them detrius free. One thing we could add to this is pics of the various species we have, along with some effort to identify them. One thing I've had a particularly difficult time with is figuring out how to identify the various Tubastrea species. I will say that identifying some of these Species is like attempting to identify various Acropora Species, even differentiating Genuses can be difficult. So often I see people rattling off information regarding the difference between Dendrophyllia and Tubastrea which is simply not true, like Dendrophyllia always has larger polyps than Tubastrea and that Dendrophyllia opens during the day and Tubsatrea does not , etc., etc. Suffice to say it's simply not that simple. VERY generally speaking, the larger polyps are on Dendrophyllia (although there are Dendrophyllia Species with extremely small polyps), and the tentacles are more translucent on Dendrophylila making their nematocyst easier to see (the little dots; Their stinging cells). The most common Species of Tubastrea we see in the hobby are T. faulkneri, T. coccenia and T. micrantha. Generally T. coccenia and T. faulkneri are either orange, yellow or pink, with variations of all of the above in a single colony sometimes. T. coccenia takes on more of a ball, and/or an ecrusting growth form with shorter coralites than T. faulkneri, which tends to branch out a bit more. T. micrantha is commonly called "black coral" or "black sun coral" and is found with black, brown or green tissue on the coralite and coenosteum (tissue between coralites), and can have green, black or brownish polyps as well as translucent or white polyps on rare occurences. T. micrantha is generally a broad, branching colony and resembles a tree in growth form. There is another "black sun coral" that is often mistaken for T. micrantha that develops more of a ball shape (not quite as branching) which is T. diaphana. aninjaatemyshoe, that is no doubt one helluva Pseudocorynactis! Natan, would it be possible to get shots from farther back so we can see the overall growth form? Out of curiosity, how do you know the first one is a T. faulkneri? What particular characteristics are you looking at? I can tell its faulkneri, coz it has orange mouth, orange skin, and its 'smaller' than other tubastreas. All shots were taken during night when it was fully opened. Out of curiosity, how long did it take for the dye to come out? Great job on the recovery of that coral too. you can still see that it was dyed but, its not awfully red right now. Any help on ID? It not sure what to expect from this beauty but I keep feeding it. My yellow tanks a good piccy! Good stuff, this thread should be a sticky so it can be easily found!! thank you so much for this primer stunreefer. i read and reread this all the time. what's your regimen for bacterial control of nitrates/phosphates. i know you use prodibio - do you just follow instructions/dosing as recommended? thank you so much for this primer stunreefer. i read and reread this all the time. what's your regimen for bacterial control of nitrates/phosphates. i know you use prodibio - do you just follow instructions/dosing as recommended? Yes, I just follow the insturctions, using one vial of BioDigest every two weeks and one vial of Bioptim per week. I also perform at least one 5 gallon water change per week on my ELOS Mini system (~20 gals net), two when I can. The skimmer that comes with the Mini system is inadequate IMO, so I'm changing that out this week actually and will be more comfortable with only weekly water changes. I will be staring to add a few gorgonians and "soft" NPS coral here over the winter which will require a constant food source, and I will have to readdress my nutrient export scheme. Hopefully just the skimmer upgrade will suffice, but I'm not opposed to adding a GFO Rx or De-Nitrate Rx if necessary. I also utilize a filter sock to catch any excess foods and detrius. I will have to reevaluate this also when I add the other non-photosynthetic coral as they'll clog up extremely fast with small particulate food and it will likely hinder my system. Do you use the nano version of BioDigest/Bioptim, or the full? Do you also still dose vodka/carbon everyday? Last edited by xsiborg; 11/11/2009 at 09:46 PM. I use the full size versions of the Prodibio products. The "nano" versions are only rated for up to 10 gallons, and I've only seen them sold in packs that also include the Iodine and Strontium supplements (which I don't use). I dillute the BioDigest and Bioptim in a cup of tank water but only use about 3/4 of it. I do not use vodka or any other carbon source; Bioptim is the carbon source made by Prodibio, and BioDigest is the bacteria source (they just strap fancy names on them). You could use a different carbon source for daily dosing if you want such as vodka... Eric of glassbox design uses BioDigest as a bacteria source and vodka, sugar and vinegar as carbon sources (dubbed "V.S.V. method"). Do you see any harm if you use all of it and not just 3/4? I am currently using Brightwell MB7/BioFuel and they are almost gone so I wanted to try prodibio. Honestly I have never used all of it before, I wouldn't expect to see any harm. I only use 3/4 of it as it's just such a small system, and don't see the need for all of it. For example, per the directions for Diodigest, "use 1 ampule per 1,000 liters" (~265 gals), and since I'm only dosing my ELOS Mini I don't use it all.